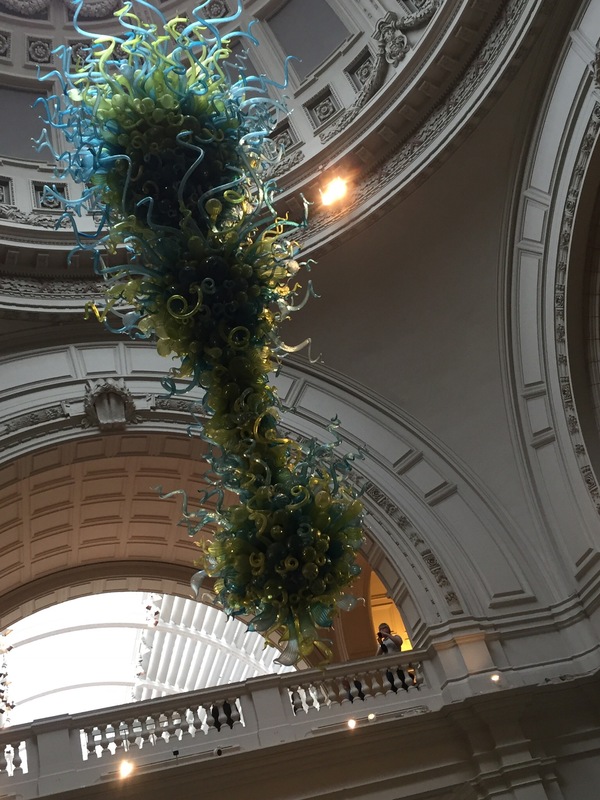 I didn’t remember that Angie and I actually visited the Victoria & Albert Museum when we were in England in 2014 until I went into the cafe and recognized the grandeur of the Morris, Gamble and Poynter rooms. There was still plenty to see that I hadn’t seen before though, and I barely scratched the surface of this museum, which is dedicated to the decorative arts and design and located in South Kensington in central London. 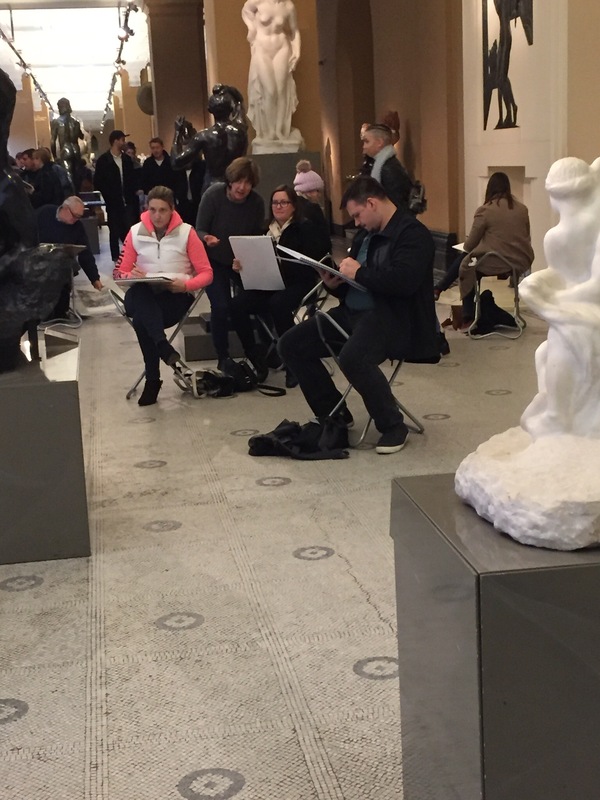 It was a busy Sunday afternoon at the V&A. I don’t know if it’s always that busy in the winter, but it was great to see.I just dipped in a little bit in some of the different rooms. I didn’t want to pay for any of the special exhibits, but there was a brand new, free one that looked interesting. This was called Lockwood Kipling: Arts and Crafts in the Punjab and London. Kipling, I learned, was the father of famed author Rudyard Kipling, and actually illustrated many of his son’s books. Although the elder Kipling played a significant role in the promotion and preservation of Indian arts and crafts, he also was a key player in the development of the South Kensington Museum, which later became the Victoria and Albert. All of it grew out of the first Great Exhibition, held in London in 1851. The exhibit included details of Kipling’s life in England and India, including his training at the Staffordshire Potteries, as well as some exquisite pieces that were added to the collection from Punjab and other parts of the British possession. There were some inlaid pieces that had so much minute detail in them that I could barely believe what I was seeing. One fascinating tidbit that I learned was that Rudyard Kipling actually only lived in India until he was 24, but he was able to build hits entire writing career on that experience. There was an unexpected Chihuly chandelier at the main entrance. I bookmarked my visit with food and drink (of course), but not knowing the area and what was on offer, I just ate at the bustling museum cafe. For lunch I picked a kale and onion tart, which was paired with two salads of my choice. I picked a raddichio and beet salad that was less bitter than I feared it would be (raddichio is usually bitter in the US), and a tabouli salad that was flavored with mint and was excellent. The tart was decent but not as flavorful as I’d have hoped. For that meal I was not able to find a table in the historic rooms, but sat at a table in one of the bright rooms next to the food stations. When I returned for a cup of tea and a scone before heading back to my sister’s house, I was able to find a spot at a shared table in one of the historic rooms (i’m afraid I don’t know which is which), eavesdropping on a conversation between a father and his grown daughter about the museum and Prince Albert’s campaign to share the throne with Victoria, rather than being her mere consort. I must read up on that battle, since I know Victoria won, perhaps because, even though Albert was a prince, he was not quite as high born as his British cousin. I only spent two or three hours at the museum, but I find that much more than that can be a bit overwhelming between the hard floors and the massive amount of exhibits. I did feel that I got some glimpses of some pretty interesting work and got some nice stimulation for my brain cells.